Vast: Teh showing a model of the Garden Residence project. Following the overwhelming response towards the freehold Garden Residence (GR) in Cyberjaya, Mah Sing Properties Sdn Bhd (MSPSB) has acquired another 14.1ha of prime freehold land adjacent to the GR township for the Clover@Cyberjaya project. The Clover@Cyberjaya will be an extension to the 46.5ha Garden Residence and will have the same concept with gated and guarded living environment. MSPSB chief operating officer Teh Heng Chong said the intention was to create an exclusive enclave on this new land. “This is the company’s future development which will be launched sometime next year. Registration is now open for the Clover properties which are two- and three-storey semi-detached homes, said Teh. He said the Garden Residence, which the company was focusing on now, comprised medium- to high-end residential homes of two and three-storey Super-link, semi-detached and three-storey bungalows within four precincts. They were conceptualised as a self-sustaining residential development. To create a resort lifestyle environment, each precinct will have its own perimeter fencing and guard house to ensure an exclusive living environment and better security. There are a total of 676 units in all four precincts combined. However the 69 units of the three-and-half-storey Blossom garden bungalow in Precinct 4 or known as the Blossom Precinct, is the most exclusive edition of the Garden Residence. Priced at RM3.2 million, these premier luxury bungalows boasts a designer central park, a rooftop garden with jacuzzi, 9+1 bedrooms/nine bathrooms, private lift and a dedicated entertainment floor all within a spacious built-up of approximately 7,796 sq ft.
“Once completed, the residents of Garden Residence will have access to The Promenade, an integrated community clubhouse and retail amenities. It is a self-contained township so to speak, with lush landscape surrounding the entire development,’’ added Teh. 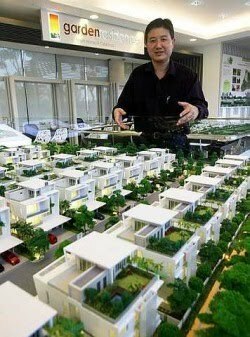 He said Mah Sing was conscious to nature thus green features have been cleverly integrated into these homes. The units in Precinct 1 (Cassia), Precinct 2 (Evergreen) and Precinct 3 (Jacaranda), is currently 85% sold within six months of launch at the sub-sale level before they were completed. The Blossom Precinct is open for registration. According to Teh, the homes have a potential of appreciating in value due to the demand in residential properties in this part of Kuala Lumpur. Teh said, the homes come with green building features such as rain harvesting system, solar powered water heaters, surface run-off collection, ample natural lighting in each home with north-south orientation and light colour roof material for better heat and light deflection. Prices for the resort homes in Precinct 1-3 ranges from RM858,800 to RM2.1 million with a built-up of approximately 2,845 sq ft to 4,514 sq ft.
Garden Residence is located within the Multimedia Super Corridor in Cyberjaya and is well connected to the Maju Expressway, North-South Expressway, Damansara-Puchong Expressway, North-South Central Link, South Klang Valley Expressway and the North Klang Valley Expressway. “With such an extensive linkages, residents will be able to reach their destinations conveniently. The ERL station is just a stone throwaway and the KL Sentral or KLIA just takes less than 20 minutes,’’ said Teh. Due to its strategic location, Teh added that apart from Cyberjaya, Garden Residence has the potential to enjoy a large market catchment from Putrajaya, Puchong, Subang Jaya, USJ, Petaling Jaya, Shah Alam, Cheras, Seri Kembangan and Seremban. PETALING JAYA: Bolton Bhd plans to sell its unit that owns Campbell Complex in Kuala Lumpur for RM50mil. This is part of the group's plan to dispose of its non-core assets and investments that do not yield reasonable returns. Bolton told Bursa Malaysia yesterday that it had entered into a sale and purchase agreement with Shapadu Resources Sdn Bhd for the disposal of its entire stake in Lim Thiam Leong Realty Sdn Bhd, which owns the 20-storey complex. The disposal will raise cash, which will be used to meet the working capital requirements and/or to repay borrowings of Bolton, it added. Bolton said it would record a gain of RM3.16mil from the disposal, resulting in an increase in its consolidated earnings per share of 11.27 sen based on the present number of ordinary shares in issue for the financial year ended March 31. BOLTON Bhd has agreed to sell its 20-storey commercial complex known as Campbell Complex to Shapadu Resources Sdn Bhd for RM50 million. The deal means selling its 100 per cent stake in Lim Thiam Leong Realty Sdn Bhd which owns the complex in Kuala Lumpur. The sale is in line with its plan to sell non-core assets and investments that do not yield reasonable returns. 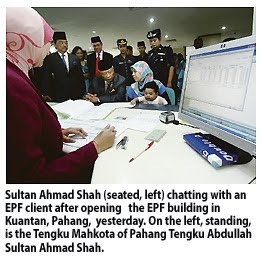 It will use the RM3.16 million gain from the sale to to repay bank borrowings and as working capital. GAMUDA Bhd said it is eyeing opportunities in the massive US$45 billion (RM141 billion) mass rapid transit (MRT) project Qatar is planning to build next year. Qatar is building the new infrastructure as it prepares to host the 2022 Fifa World Cup finals. Gamuda group managing director Datuk Lin Yun Ling said the MRT system will be part capital city Doha's key transport infrastructure. "The Qatari government needs the entire system to host the event and tender is expected to be announced next year, and when that happens, Gamuda will be ready to submit its tender," Lin told reporters after its shareholders' meeting in Shah Alam, Selangor, yesterday. 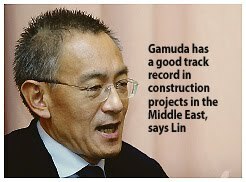 Lin said Gamuda has a good track record and is well-positioned to take part in construction projects in the Middle East, especially in Qatar as it is involved in the ongoing construction of the New Doha International Airport. Gamuda's other on-going projects in the Middle East include the Dukhan highway in Qatar and the Sitra causeway bridges in Bahrain which are due to be completed by year-end. 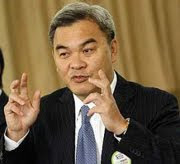 On its property development projects, Lin said the company expects to rake in a record RM1 billion worth of sales this year and another RM800 million in unbilled sales. Gamuda is anticipating total sales of RM5 billion in the next two years, of which RM2 billion will be from local sales while the remaining RM3 billion from its Gamuda City project in Hanoi. 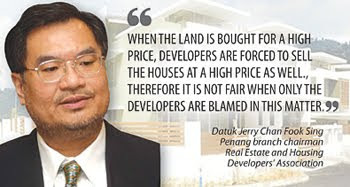 "The property market is hot at the moment due to low interest rates, and banks have a lot of loan provisions on this sector and people do not want to sit on cash and lose its value preferring to get involved in assets. "Our landbank is ample and our priority is also to sell low-yielding landbank and develop innovative developments for other strategic landbanks." Lin added. 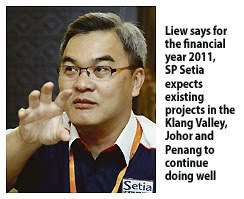 On the greater KL MRT project, Lin said the Cabinet has yet to approve its joint proposal with MMC Corp Bhd. He said the government, Prasarana (Syarikat Prasarana Negara Bhd) and Spad (Land Public Transport Commission) will decide on the location of train stations, railway alignment, railway network and get feedback from the public and other stakeholders before Gamuda and MMC take up the offer to deliver the RM45 billion project.